VENTURA – For the first time since 2008, Ventura Harbor is likely to benefit from a complete dredging project in 2015 thanks to the additional funding proposed for the President’s 2015 budget. Ventura Port District officials received the news on Tuesday, March 4. Released along with the President’s proposed 2015 budget is a work plan modification for the U.S. Army Corps of Engineers, which oversees dredging, for the current year. The plan designates $7.071 million for dredging, but about $4 million of that was spent on the dredging work done this February and March by Manson Construction. 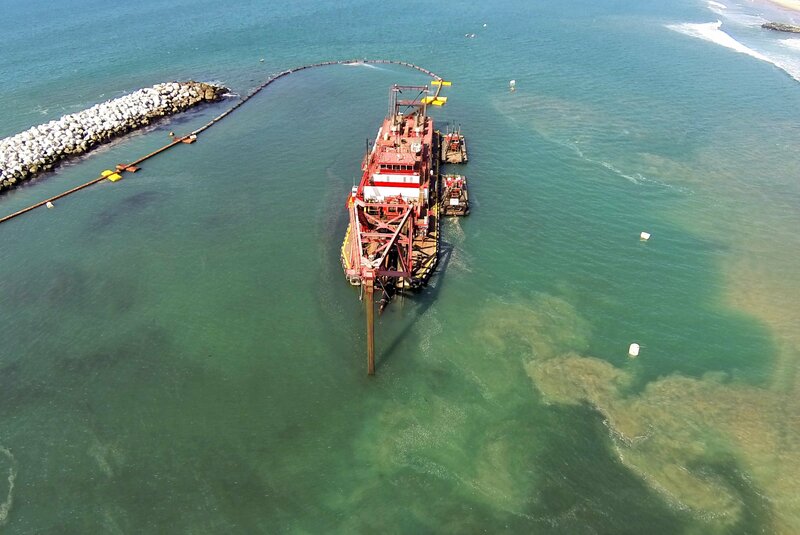 The remaining funds can’t be spent on the current dredge project, however, about $3 million will roll over and can be added to the $3.54 million the President’s proposed 2015 budget designates for dredging next year, Parsons explained. The allocated funds should pay for a complete dredging. On Feb. 10, the harbor underwent its winter dredge where only half of the 900,000 cubic yards of accumulated material was dredged. Approximately 450,000 cubic yards of sediment was dredged. “The work that was just done will get us through to next year,” Parsons said. Each year, an average of about 600,000 cubic yards of sand moves down the coast in Ventura, accumulating at the Ventura Harbor entrance and potentially making the harbor impassable for commercial and recreational powerboats and sailboats, he explained. In 2011, the Corps dredging project was so minimal that the Ventura Port District funded additional dredge work. The $2.3 million federal dredging project cleared the entrance, but left the sand trap completely full. The Ventura Port District spent $1.5 million of its dredging reserve in 2012 – in addition to the $2.2 million the Corps spent that year on dredging work – to clear part of the sand trap. When adequately dredged, the sand trap at Ventura Harbor captures the sand before it accumulates in the harbor entrance. However, without adequate annual dredging, the sand trap fills to capacity, the entrance fills with sand, and the waterway becomes impassable for commercial boats first, sailboats second and eventually recreational power vessels, according to the port. Dredging is essential to remove sediment buildup and keep Ventura Harbor open and safe for vessels. In recent years, federal budget cuts have made it a major challenge for the Ventura Port District to ensure that enough federal dollars will come in to dredge each winter. To secure funding for dredging, Ventura Port District officials have led efforts over the past two years to demonstrate the importance of annual dredging at Ventura Harbor. This effort was launched because for the first time in 30 years, the President’s 2013 budget did not include funding for dredging, leading to widespread concern that Ventura Harbor would be unsafe for vessels if not dredged and could face closure. Federal money was eventually found for a partial dredging.